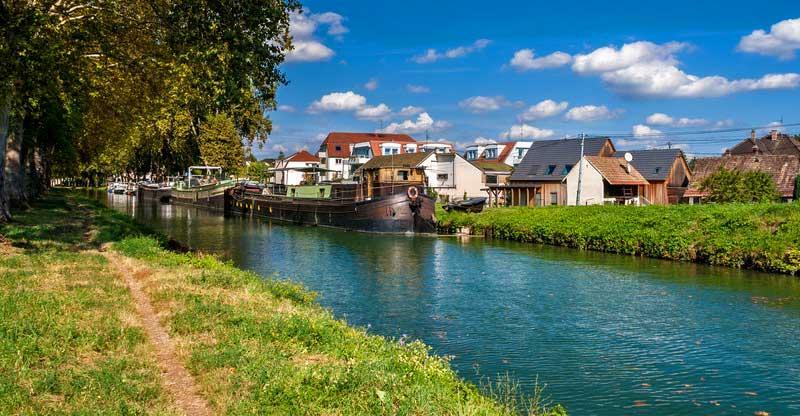 It’s surprising to learn that there are so many waterways for Canal Boating France. You can easily captain your own boat. Many places give you brief instructions and let you drive away in a barge a few minutes later. No license is required. With accommodation for 2 – 6 passengers and no crew, this option is far less expensive than the traditional river cruises on major waterways. The Canal des Deux Mers (Canal of Two Seas) in southern France is comprised of the Canal du Midi and the Canal de Garonne. 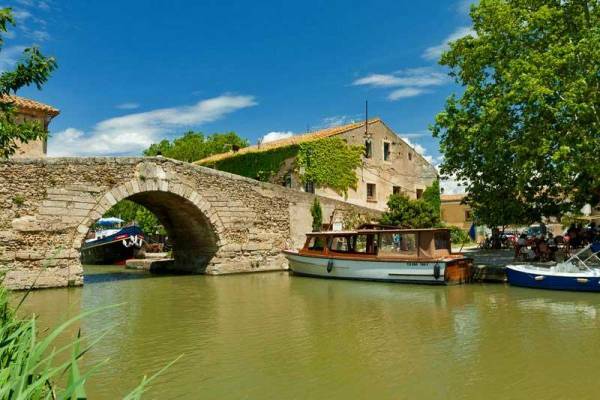 The Canal du Midi is the most popular canal boat cruise in France. It runs 150 miles (240 km) from Toulouse to the Mediterranean. There are two options to access the Mediterranean. One is south through Narbonne and the other is east through Beziers. Beziers marks the start of the Camargue canal area of saltwater lagoons and beaches. Pass through the Etang de Thau along the Mediterranean and then continue along the Canal du Rhône. The Canal de Garonne covers 120 miles (200 km) from Toulouse north to Castets-en-Dorthe through the Aquitaine canal area. Enjoy fine dining in this region. From Castets-en-Dorthe the Garonne continues on to Bordeaux and the Atlantic. the Loire Valley – a series of canals in central France just south of Paris. The Loire is famous for its châteaux and Roman towns. 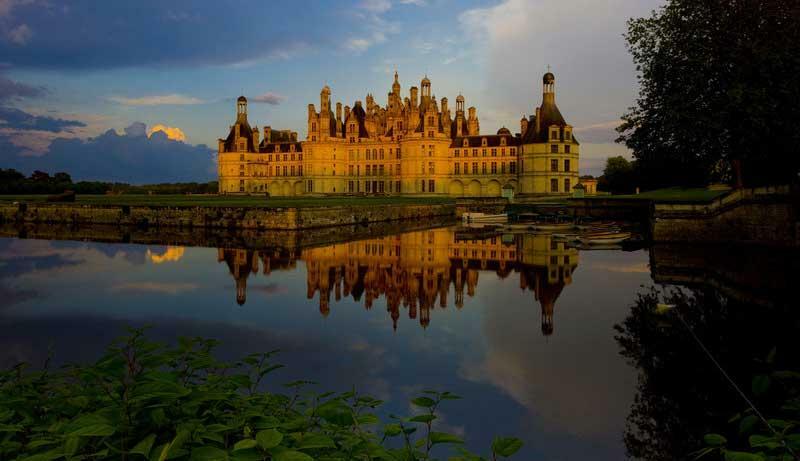 See the famous Châteaux de Chambord at the river’s edge. Nivernais – the River Yonne in central France, near the Loire. Have chablis and view ancient cathedrals. 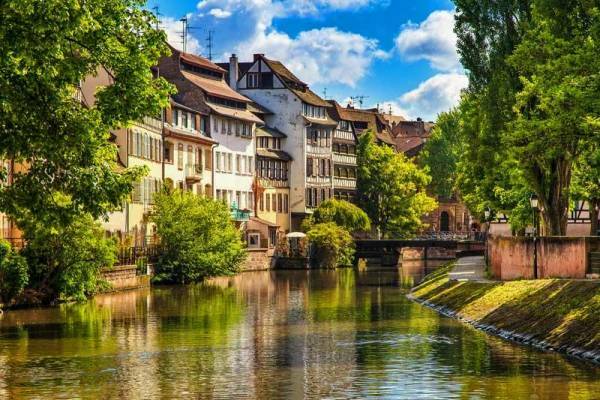 Alsace-Lorraine – in northeast France. This is a forested area at the border with Germany. Burgundy – east France and the Saône River. Known for its wines and vineyards. Brittany – the Canal de Nantes a Brest in western France. Enjoy seafood as you approach the Atlantic. Charente – the Charente River in western France, north of Bordeaux. This area is famous for cognac. Lot River – in southwestern France with medieval hilltop towns, vineyards and limestone cliffs along the Lot River. Le Boat.com – the largest rental company with the greatest number of options.